In our continued efforts to help our readers, we are sharing 4 ways to keep new puppy costs low. Inviting a new pup into your life is exciting, and you can get your home ready for your new furry friend with a budget. We’re confident that you will find these suggestions helpful while also bringing you closer to welcoming that new puppy into your home. If you know that a puppy will be joining your home soon, why not add puppy items to your holiday gift list this year? So when grandma asks what you want for Christmas, instead of saying an iPad, why not ask for a dog crate or even a gift card to a pet supply store? Also, instead of asking Uncle John for his annual Chanukah gift card to your favorite clothing store, request a bottle of NuVet Plus. You’ll be able to provide your pooch with high quality nutrients, with no cost to you. Visit NuVet Plus reviews to see what happy parents are saying these human-grade pet supplements..
All types of stores, including pet supply stores, have sales. Some stores even have entire sections dedicated to products on clearance – take advantage! Don’t be afraid to visit this part of the store during your search for puppy items. Dishes, bedding, treats, grooming supplies – you name it – can be found at reduced prices. Also, check out your local Goodwill or Salvation Army stores. Many times people donate new or barely used pet items. Purchasing doggie items at a local Goodwill or Salvation Army will allow you to get necessary items for a fraction of the cost. Garage sales and flea markets are also good places to check out. What are friends for if you can’t ask them for a little help? Let them know about your plans to bring a puppy into your life. Ask them to keep their eyes peeled for doggie deals. See if any of your friends will be willing to puppy sit for you if necessary. If you are great at fixing computers and your best friend is a certified dog trainer, why not swap skills? It’s a win-win situation! Or if a pal insists on paying you for some home improvement help you supplied, why not ask them to pick up a couple bottles of your dog’s NuVet Plus instead? Don’t forget that you are going to need to train your pooch. 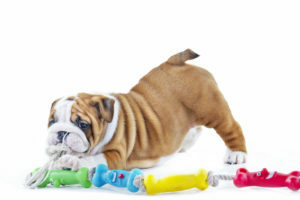 Your local library, the Internet, and even your nearby pet supply store can provide you with the resources you need to make sure you have a well behaved pooch. Many novice dog trainers have found a lot of help on YouTube where expert dog trainers share their techniques. The library has loads of books on dog behavior. Pet supply stores sometimes offer free classes to prospective long-term students. There are many options! We hope that you find these tips helpful when it comes time to calculating your budget with your new canine family member. Just like excellent nutrition, we feel that owning a dog shouldn’t cost a fortune, which is why we created NuVet Plus. Comprised of human-grade ingredients and produced in an FDA registered lab, you can feel confident that your pup is receiving the best when it comes to vitamins. Dog parents who already provide their beloved pooches with this excellent product have eagerly shared their thoughts and experiences with us on our testimonials page. If you would like to learn more about NuVet Labs and our products, please visit us here.